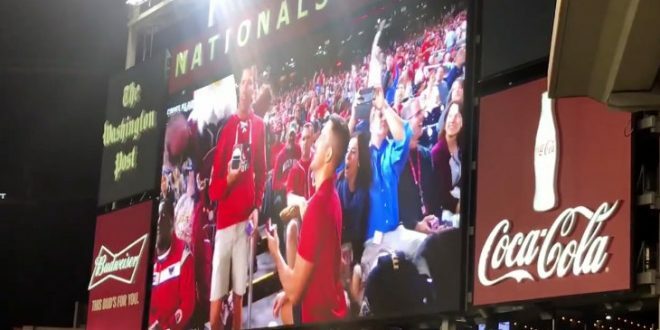 Crowd Cheers Gay Proposal At MLB Game [VIDEO] - Joe.My.God. Nationals fans were able to witness a special moment between couple Ty Fleming and Tyler Garrison on Friday. The moment Fleming and Garrison became officially engaged was captured during the Washington Nationals versus Pittsburgh Pirates game. The crowd cheered for the happy couple, who even received a congratulations hug from Screech the mascot. The Nationals clinched their division two weeks ago. Their first playoff game against the Chicago Cubs is Friday.